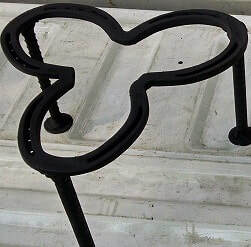 Trivets are a great way to help control bottom heat when cooking in dutch ovens. Our trivets come in two sizes, 6'' tall and 3'' tall. 6'' trivets are used when baking items such as breads, biscuits, and cakes. The 3'' trivet is good for cooking things like stews and chili that will be stirred on a regular basis so that there's not as much a risk of burning the bottom. Save money by buying a set of 2. Make sure you can pick your cast iron out of a line up each and every time. These tags come in sets of two (one for your dutch oven and one for the lid) and can be personalized with up two three initials and a number. All tags come with a split ring in order to attach them. Call family and friends to dinner just like they did in the old days!